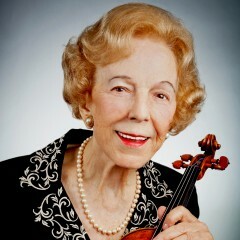 The internationally renowned violinist Alice Schoenfeld has been in the public eye, both as an instrumentalist and a pedagogue, for many decades. Her prodigious talent at a young age brought her family to Berlin to maximize her musical education, Schoenfeld making her debut with the Berlin Philharmonic at the age of ten. A protégé of the eminent professor Karl Klingler, an heir of the great Joachim tradition, she rose quickly to the top rank of violinists. After World War II, Schoenfeld moved to Los Angeles, maintaining her career as a recitalist and a soloist with a breadth of leading orchestras all over the world. She performed many times with an array of famed conductors past and present, including the likes of Hans Schmidt-Isserstedt, Joseph Keilberth, Eugen Jochum, Hans Swarowsky, Ferdinand Leitner, Lawrence Foster and Zubin Mehta, to name but a few. Alice Schoenfeld also found particular fame concertizing internationally with her sister, the cellist Eleonore Schoenfeld, as the Schoenfeld Duo. Schoenfeld long enjoyed the career of an eminent guest artist at festivals around the world, including the Schleswig-Holstein Music Festival (Germany), the Summer Festival Hvar (Croatia), Centre d’Arts Orford (Canada), the Killington Music Festival (Vermont), the Bowdoin International Music Festival (Maine), plus chamber music festivals under the auspices of the National German Music Council and the Klingler Foundation. A much sought after teacher and clinician, Schoenfeld has given master classes and lectures worldwide. As the Alice and Eleonore Schoenfeld Endowed Chair in String Instruction and professor emerita of violin at the USC Thornton School of Music, she has attracted students from all over the world. Her students have repeatedly been top prizewinners in national and international competitions, and many have made their mark soloing with the New York Philharmonic, Los Angeles Philharmonic, the Royal Concertgebouw Orchestra, Vienna Symphony, the Israel Chamber Orchestra, and others.